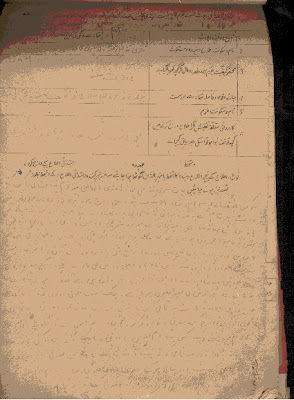 Isnt that surprising that this FIR was in Urdu ? But that is reality , read full translation and original copy of the F.I.R. First Information of a Cognizable Crime Reported under Section 154, C.P.C. Date and hour of occurence : 30.1.1948 / 5:45 P.M.
Today I was present at Birla House. Around ten minutes past five in the evening, Mahatma Gandhi left his room in Birla House for the Prayer Ground. Sister Abha Gandhi and sister Sanno Gandhi were accompanying him. Mahatma was walking with his hands on the shoulders of the two sisters. Two more girls were there in the group. I alongwith Lal a Brij Kishan, a silver merchant, resident of No. 1, Narendra Place, Parliament Street and Sardar Gurbachan Singh, resident of Timar Pur, Delhi were also there. Apart from us, women from the Birla household and two-three members of the staff were also present. Having crossed the garden, Mahatma climbed the concrete steps towards the prayer place. People were standing on both the sides and approximately three feet of vacant space was left for the Mahatma to pass through. As per the custom the Mahatma greeted the people with folded hands. He had barely covered six or seven steps when a person whose name I learnt later as Narayan Vinayak Godse, resident of Poona, stepped closer and fired three shots from a pistol at the Mahatma from barely 2 / 3 feet distance which hit the Mahatma in his stomach and chest and blood started flowing. Mahatma ji fell backwards, uttering "Raam - Raam". The assailant was apprehended on the spot with the weapon. The Mahatma was carried away in an unconscious state towards the residential unit of the Birla House where he passed away instantly and the police took away the assailant. Having received the information I rushed to the Birla House to find the dead body of the Mahatma at room No. 3. Met Shri Nand Lal Mehta, his statement recorded and got confirmed after reading it out to him. Copy of the statement handed over to him. Came to know that the assailant was whisked away by the Assistant Sub-Inspector. It was a case of Section 302 Indian Penal Code. All the case papers were sent to the Police Station Tughlak Road and I got engaged in conducting investigations. A special report may be forwarded through the police station. Why FIR was in Urdu? Is there any particular reason?